Letterhead templates - A letterhead is an essential part of a company's corporate identity. The letterhead design can take many formats with with the logo being on the top, side or even bottom. Most letterheads have the logo at the top of the page. Corporate letterheads usually includes a company logo and name, company address, telephone and fax numbers, general email address and company website address. The standard size of a formal letter paper is A4 size which is 297x210mm. Like a business card, a letterhead should give a lasting impression. It can be printed on different types of paper. It is necessary to check that the paper will go through a standard office printer. People often make the mistake of printing letterheads on paper that have to be discarded as it causes paper jams. It is ideal to use one or two color prints on the letterhead to be economical if you are using litho print. You can use more colors if you are printing digitally. Many companies use an electronic header and footer instead of printing onto a letterhead. 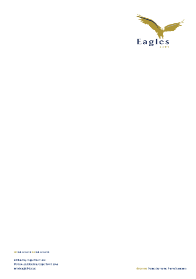 Letterhead templates are available in easy to use formats. A letterhead can be focused on the company logo. The logo can be on the left and the company details should be on the right, and vice versa. Otherwise, a letterhead that does not include a logo should be centered, with the company name in larger font size and highlighted in bold.